I bought an ice cream maker last year, mostly because my family are ice cream fiends, and partly because the fresh taste of homemade ice cream is so much better than store bought. I also like to avoid the questionable additives that are found in the store bought variety. Have you ever read the ingredient list on a carton of ice cream? Scary. Since we brought home our machine, the potential has never really been explored, making plain vanilla most of the time. There's nothing wrong with vanilla, I love the simplicity and richness in the pure vanilla flavor, but sometimes I like to explore outside of the box. You may remember reading of my affinity for killing any living plant that has the misfortune of coming home with me. Because of this, I usually pass by the displays of pretty potted flowers, and lush houseplants, thinking to keep the poor plants safe from my life-sucking-anti-green-thumb. However, my good intentions went to the wind, when I passed a row of little rosemary plants outside of a store. They were on clearance marked down to a dollar, and since I love rosemary, I thought I'd give plant nurturing one more try. I'm glad I did! I'm proud to say my plant is still green, and going strong nearly 2 months later. There's something about using my own fresh rosemary in dishes, that makes me feel good. This little plant has found it's way into chicken dishes, pork, marinades, eggs, even lemonade. I feel like he is a true member of the family now :) You are wondering right now if this crazy girl actually talks to her plant, aren't you? When deciding to make some ice cream the other day, I knew I wanted to try something different, and my eyes fell to my plant. I knew I loved rosemary used in a sweet way, from the Blackberry Rosemary Lemonade I had made, and decided to give it a shot in ice cream. 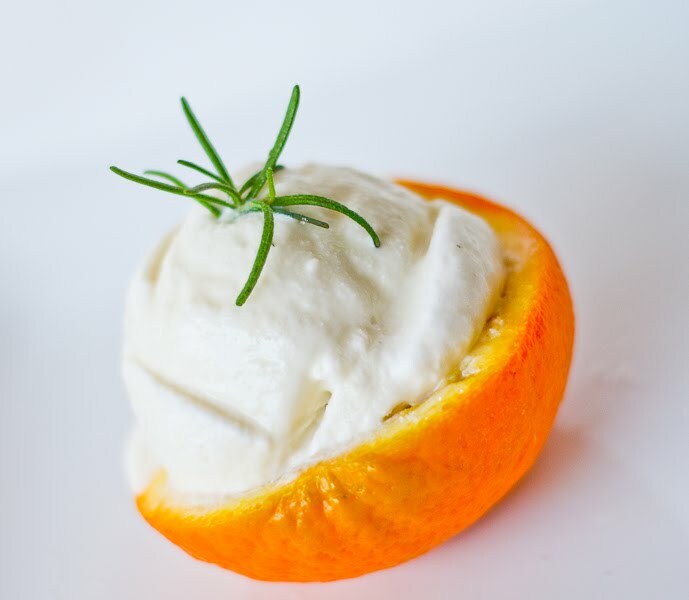 I infused the cream with rosemary and orange, and sweetened it with honey and a little sugar. This may be my new favorite flavor. With a rich honey flavor, and subtle hints of rosemary and orange, this was so good. Slice an orange in half, and using a sharp knife slice the orange rind from one of the halves. Try to slice off only the orange rind, with as little of the white membrane as possible. In a medium saucepan over medium heat, bring the milk and cream to a simmer. Add the honey and sugar, and stir until dissolved. Add the orange rind and rosemary sprigs, then remove from heat and let steep for 15-20 minutes, or until you reach your desired taste. 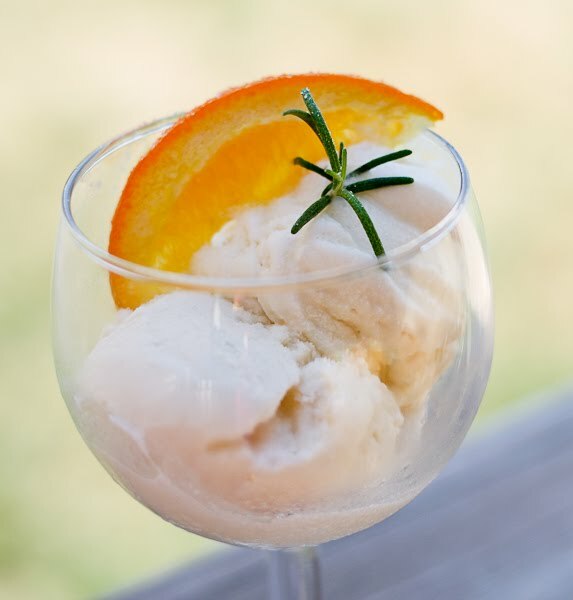 Remove the rosemary sprigs and orange rind, then place the milk mixture in the refrigerator or freezer until chilled. Once the cream mixture has chilled, add the freshly squeezed orange juice and stir to mix. Pour the cream into your ice cream container and make according to your machine's directions. Then, place the ice cream in a container, cover, and put in the freezer until firm. Serve and enjoy! it sounds lovely. i just made a batch of strawberry balsamic last night. :) i love unique ice cream flavors! 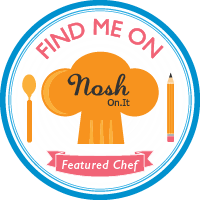 Love this idea and so glad i just recently found your site! I love new ice cream flavors like this one! This sounds lovely! 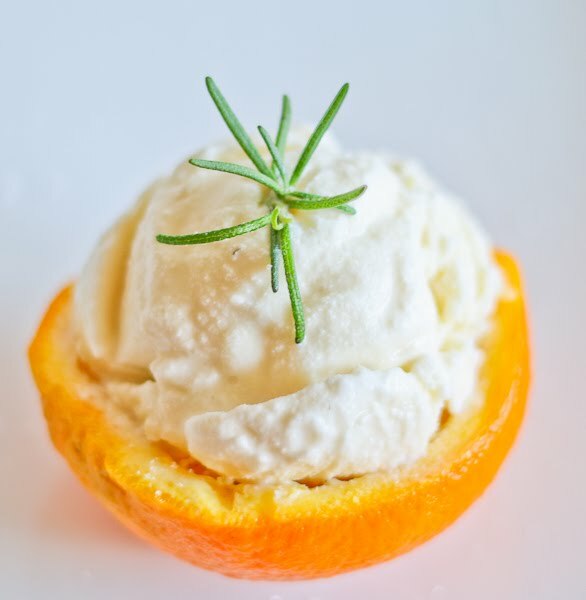 I've never had rosemary in ice cream, but I bet it's delicious with the orange. Thanks! What a unique delicious sounding ice cream! Your photos are great and you definitely have a "green thumb" with the way that rosemary looks! Way to go! What a unique recipe. I love adding rosemary to desserts, I think it imparts such a bright flavor. I love the idea of these two flavors subtly mixing with the honey. And I love that you served it in little orange cups! Bet this tastes amazing! Discovered the other day that citrus and rosemary is an amazing flavour combo (I made some lemon & rosemary cupcakes). What an interesting flavor combo. I did something similar last week. I made Raspberry-Basil Ice Cream. This sounds so delicious... and I love your presentation of the ice cream in the orange peel. So creative! Ooo! You did it now! You created heaven! 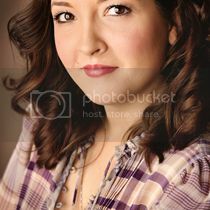 That is amazing. 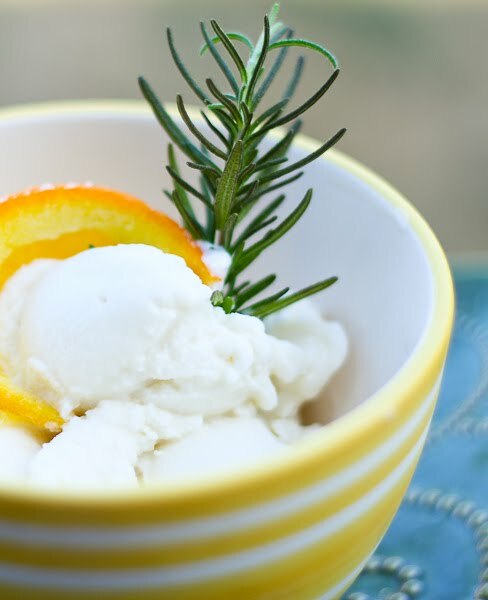 What a wonderfully refreshing ice cream, I love the addition of rosemary!